Elasticsearch is an open source search engine based on Lucene, developed in Java. It provides a distributed and multitenant full-text search engine with an HTTP Dashboard web-interface (Kibana). The data is queried, retrieved and stored in a JSON document scheme. Elasticsearch is a scalable search engine that can be used to search for all kind of text documents, including log files. Elasticsearch is the heart of the 'Elastic Stack' or ELK Stack. Logstash is an open source tool for managing events and logs. It provides real-time pipelining for data collections. Logstash will collect your log data, convert the data into JSON documents, and store them in Elasticsearch. Kibana is an open source data visualization tool for Elasticsearch. Kibana provides a pretty dashboard web interface. 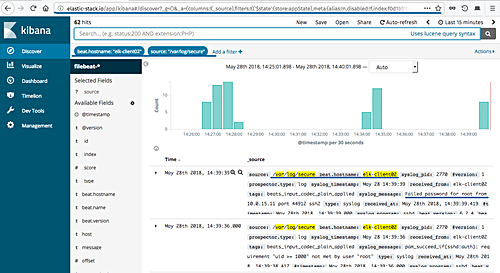 It allows you to manage and visualize data from Elasticsearch. It's not just beautiful, but also powerful. In this tutorial, I will show you how to install and configure Elastic Stack on an Ubuntu 18.04 server for monitoring of server logs. Then I'll show you how to install and configure 'Elastic beats' on an Ubuntu 18.04 and a CentOS 7 client server. In this first step, we will install and configure the 'Elastic Stack' on the 'elk-master' server, so run all commands and stages for this step on the 'elk-master' server only. 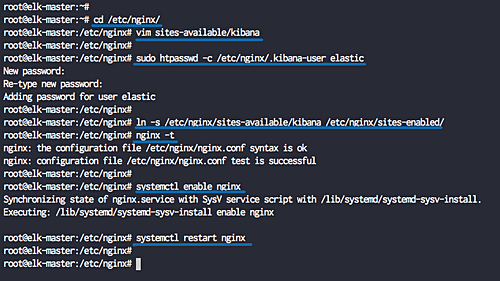 We will install and configure each component of the elastic stack, including Elasticsearch, Logstash shipper, and Kibana Dashboard with Nginx web server. Java is required for the Elastic stack deployment. Elasticsearch requires Java 8. It is recommended to use the Oracle JDK 1.8, and we will install Java 8 from a PPA repository. Install the 'software-properties-common' and 'apt-transport-https' packages, and then add the PPA 'webupd8team' Java repository. Run the 'apt install' and 'add-apt-repository' command below. After the installation is complete, check the java version. Java 1.8 installed on the system. Next, we will configure the java environment. Check the java binary file using the command below. And you will get the java binary file on the '/usr/lib/jvm/java-8-oracle' directory. Now create the profile file 'java.sh' under the 'profile.d' directory. Paste java environment configuration below. Make the file executable and load the configuration file. Now check the java environment using the command below. 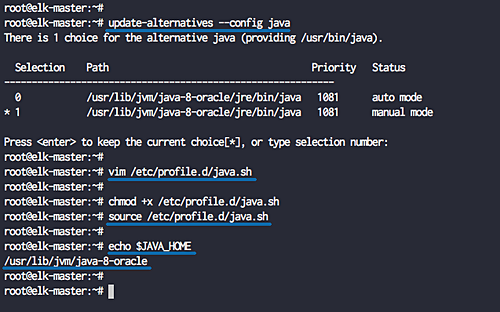 And you will get the java directory is located at '/usr/lib/jvm/java-8-oracle' directory. After installing Java, we will install the first component of the Elastic Stack, we will install the elasticsearch. Add the elastic stack key and add the elastic repository to the system. Now update the repository and install the elasticsearch package using the command below. After the installation is complete, go to the '/etc/elasticsearch' directory and edit the configuration file 'elasticsearch.yml'. Uncomment the 'network.host' line and change the value to 'localhost', and uncomment the 'http.port' line for the elasticsearch port configuration. Now start the elasticsearch service and enable it to launch every time on system boot. 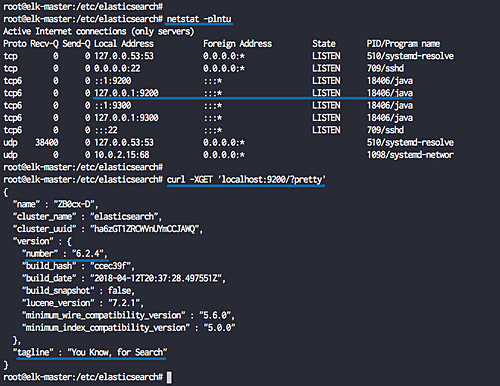 The elasticsearch is now up and running, check it using netstat command netstat and curl commands below. Now you will get the elasticsearch version '6.2.4' is running on the default port '9200'. The elasticsearch installation has been completed. The second component is a kibana Dashboard. We will install the Kibana dashboard from the elastic repository, and configure the kibana service to run on the localhost address. 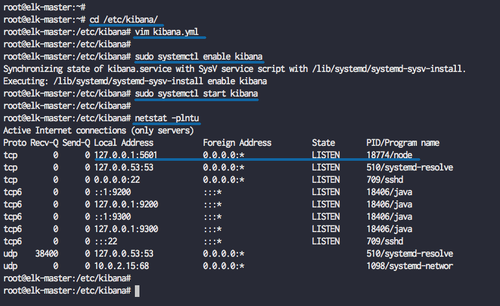 Install Kibana dashboard using the apt command below. 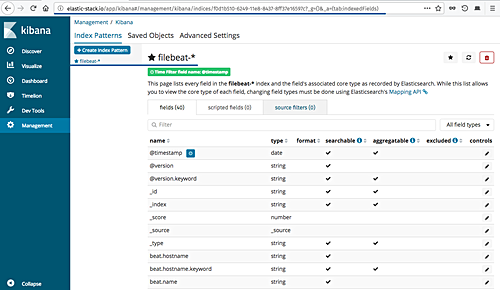 Now go to the '/etc/kibana' directory and edit the configuration file 'kibana.yml'. Uncomment those lines 'server.port', 'server.host', and 'elasticsearch.url'. Now start the kibana service and enable it to launch everytime at system boot. The kibana dashboard is now up and running on the 'localhost' address and the default port '5601'. Check it using netstat command below. Kibana dashboard installation has been completed. In this tutorial, we will be using the Nginx web server as a reverse proxy for the Kibana Dashboard. Install Nginx and the 'apache2-utils' packages to the system. After the installation is complete, go to the '/etc/nginx' configuration directory and create new virtual host file named 'kibana'. Paste Nginx virtual host configuration below. Next, we will create new basic authentication web server for accessing the Kibana dashboard. We will create the basic authentication using the htpasswd command as below. Activate the kibana virtual host and test all nginx configuration. Make sure there is no error, now start the Nginx service and enable it to launch everytime at system boot. Nginx installation and configuration as a Reverse-proxy for the Kibana dashboard have been completed. The last component for the Elastic Stack for this guide is the 'Logstash'. We will install and configure Logsatash to centralize server logs from client sources with filebeat, then filter and transform all data (Syslog) and transport it to the stash (Elasticsearch). Before installing logstash, make sure you check the OpenSSL Version your server. For this guide, we will be using the OpenSSL '1.0.2o'. If you're still using the OpenSSL version 1.1.2, you will get an error at the logstash and filebeat SSL connection. 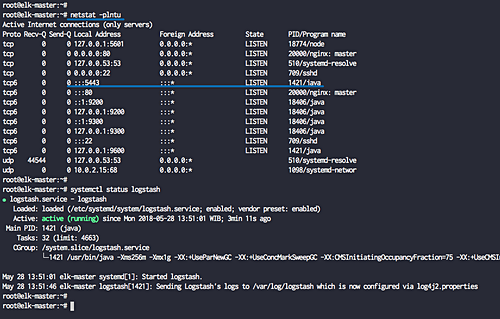 Install logstash using the apt command below. After the installation is complete, we will generate the SSL certificate key to secure the log data transfer from the client filebeat to the logstash server. Edit the '/etc/hosts' file using vim. Now create new SSL directory under the logstash configuration directory '/etc/logstash' and go to that directory. Generate the SSL certificate for Logstash using the openssl command as below. The SSL certificate files for Logstash has been created on the '/etc/logstash/ssl' directory. Next, we will create new configuration files for logstash. We will create a configuration file 'filebeat-input.conf' as input file from filebeat, 'syslog-filter.conf' for syslog processing, and then a 'output-elasticsearch.conf' file to define the Elasticsearch output. Go to the logstash configuration directory and create the new configuration files 'filebeat-input.conf' in the 'conf.d' directory. For the syslog processing log data, we are using the filter plugin named 'grok' to parse the syslog files. Create a new configuration 'syslog-filter.conf'. And for the elasticsearch output, we will create the configuration file named 'output-elasticsearch.conf'. When this is done, start the logstash service and enable it to launch everytime at system boot. Check the logstash service using netstat and systemctl commands below. And the logstash service is now up and running. Running on the public IP address with port '5443'. The Elastic Stack installation has been completed. In this step, we will configure the Ubuntu 18.04 client 'elk-client01' by installing the Elastic Beats data shippers 'Filebeat' on it. Before installing the filebeat to the system, we need to edit the '/etc/hosts' and download the logstash certificate file 'logstash-forwarder.crt' file to the 'elk-client01' server. Edit the '/etc/hosts' file using vim editor. Copy the logstash certificate file 'logstash-forwarder.crt' using scp command. Next, install the Elastic Beats 'Filebeat' by adding the elastic key and add the elastic repository. Update the repository and install the 'filebeat' package using the apt command below. After the installation is complete, go to the '/etc/filebeat' directory and edit the configuration file 'filebeat.yml'. Now enable the filebeat prospectors by changing the 'enabled' line value to 'true'. 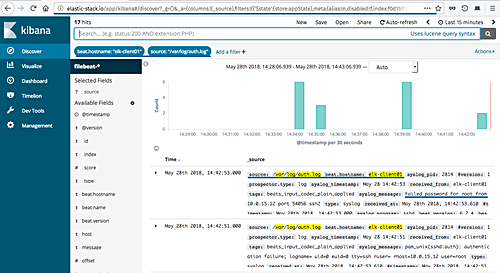 Define system log files to be sent to the logstash server. For this guide, we will add the ssh log file 'auth.log' and the syslog file. Setup the output to logstash by commenting the default 'elasticsearch' output and uncomment the logstash output line as below. Next, we need to edit the 'filebeat.reference.yml' file to enable filebeat modules, and we will enable the 'syslog' module. Enable the syslog system module for filebeat as below. Copy the logstash certificate file 'logstash-forwarder.crt' to the '/etc/filebeat' directory. Filebeat installation and configuration have been completed. Now start the filebeat service and enable it to launch every time at system boot. Check the filebeat service using commands below. The filebeat shippers are up and running under the Ubuntu 18.04 server. In this step, we will configure the CentOS 7.5 client 'elk-client02' by installing the Elastic Beats data shippers 'Filebeat' on it. Before installing the Filebeat to the system, we need to edit the '/etc/hosts' and download the logstash certificate file 'logstash-forwarder.crt' file to the 'elk-client02' server. Install filebeat using the yum command below. Now enable the filebeat prospectors by change the 'enabled' line value to 'true'. Filebeat installation and configuration have been completed. Now start the filebeat service and add it to the boot time. The filebeat shippers are up and running under the CentOS 7.5 server. Open your web browser and type the elastic stack domain name, mine is: 'elastic-stack.io'. You will be prompted the username and password from the basic authentication to the Kibana Dashboard. Type the username 'elastic' with your password. 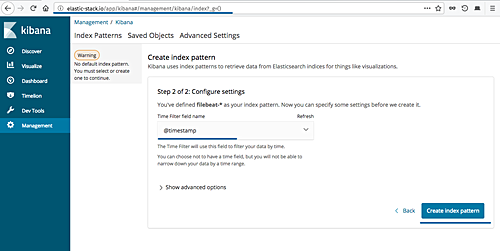 Now you will get the beautiful kibana dashboard, click the 'Set up index patterns' button on the right. Define the 'filebeat-*' index pattern and click the 'Next step' button. For the 'time filter field name', choose the '@timestamp' and click 'Create index pattern'. And the filebeat index pattern has been created. Next, we will try to get the log information for the SSH login failed on each client servers 'elk-client01' Ubuntu system and 'elk-client02' CentOS system. Inside the Kibana Dashboard, click the 'Discover' menu to get all server logs. Set the 'beat.hostname' to the 'elk-client01' server, the 'source' is the '/var/log/auth.log' file, and you will get the result as shown below. 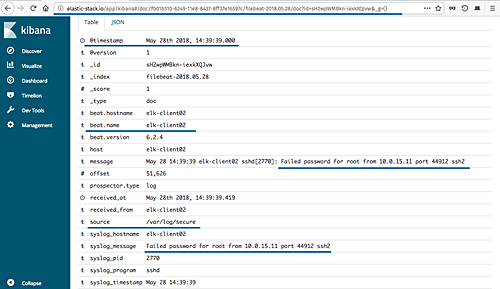 And following is the sample log details for SSH failed password from the 'auth.log' file. For the 'elk-client02' CentOS server, set the 'beat.hostname' to the 'elk-client02' server, the 'source' is the '/var/log/secure' file, and you will get the result as shown below. And following is the sample log details for SSH failed password from the 'secure' file. The Elastic Stack and the Elastic Beat 'Filebeat' installation and configuration have been completed successfully. Was there any reason for you to choose 2 ubuntu and then 1 centos server? Wouldn't it make more sense to use the same operating system for easier maintenance? This is a good tutorial, but is anyone else having issues with the the NGINX proxy? When I go to the page, all I get is the "Welcome to NGINX!" page. It's not redirecting and I can't see where I made any errors in the configuration files or anything. Is there a step that's missing that I would know if I was an NGINX expert?